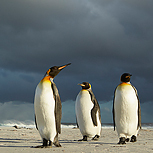 The Falkland Islands may be one of the remotest archipelagos in the world but they are also among the most dramatic when it comes to wildlife photography opportunities. The isolated beaches here are home to some of the most engaging and confiding seabirds in the world – the elegant King Penguin in their large rookeries, the acrobatic Gentoo Penguin flying out of the sea on an incoming wave, the majestic Black-browed Albatross atop their chimney-like nests in their vast isolated colonies and the striking colours of Imperial Shag will be among the many highlights of this full-on and highly focussed trip. With a beach full of Elephant Seal and the possibility of Orca hunting them close to the shore it’s not just birds on offer either. We have chosen to work at the best locations for these and allowed ourselves enough time at each place to really do them the justice that a trip of this nature really warrants. This really is a place that will simply blow you away photographically and a genuine trip of a lifetime. Day 1: We propose to organise our transport to Port Stanley in the Falklands using the MOD service from Brize Norton airfield in Oxfordshire. The 18-hour flights leave in the evening and involve a stop (for re-fuelling and the chance to stretch our legs) at Cape Verde on the way whilst the runway at Ascension Island, the usual stopover, is undergoing repairs. Although more expensive than the route via Santiago this is a much quicker route that runs more than the one day a week the alternative offers hence our choice of this as our way there and back: we will talk about the process for booking these flights with you once you have a confirmed place on the trip with us and they become open for booking. Day 2: After our long flight we will arrive at Mount Pleasant airfield and transfer to our hotel on the outskirts of Port Stanley where we will settle in, acclimatise, enjoy an evening meal hopefully stretch our legs and camera fingers on the nearby shore and get ready for our first early start the next morning! Day 3: We will transfer today to Carcass Island in the west of the Falklands which will be our base for the next 5 nights. Carcass is a small peaceful island that holds a very large and wide variety of bird species which are all highly approachable and confiding. We will make our transfer using the Falkland Islands Government Air Service (FIGAS) and with precise timings only advised the day before we will use the rest of the day to settle into our new base and begin photographing as this allows. 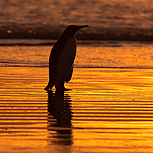 Days 4 – 7: Carcass Island’s main attractions are the large numbers of Gentoo and Magellenic Penguins in a variety of settings including sandy beaches, coves and surfing in blue seas. There are also good numbers of Striated Caracara (known locally as the Johnny Rook), which can be very bold offering good photographic opportunities and an excellent Imperial Shag colony. Carcass is also the base from which, when precisely will be dependant, on the weather, we will undertake a 2-day trip (with overnight stop) to Steeple Jason Island. This should be a real highlight of the trip as it is home to the largest Black Browed Albatross colony in the world (estimated at more than 200,000 pairs and stretching over 2 miles making it the largest colony in the world) and we will enjoy our 2 days here photographing these magnificent birds soaring across the ocean, sitting on their tall “chimney like” nests where there will be the chance to see newly hatched birds being fed by their parents and also guarding the nests alone: it will be an amazing two days. During our time based here at Carcass we also have scheduled a one-day excursion to West Point Island to visit a second Black Browed Albatross colony in a generally more vegetated setting and the chance to add some real breadth to our portfolio of these beautiful birds. With waders, geese, cormorants, larks and ducks all around as well on Carcass itself as well we will never be short of photographic opportunities here. Days 8 – 10: We will make our transfer, again using FIGAS, to Saunders Island where we will be based for 3 nights at the 2 different locations offering accommodation on this particular island. The first, at the justifiably famous The Neck puts as at the heart of the island’s Black-browed Albatross colony and also a huge beach area facing both north and south (hence its name as it is literally a neck on the island) and is home to the largest colonies of Gentoo Penguins in the archipelago. The accommodation is quite basic at The Neck and we will have to self-cater for the 2 nights in question, but it offers a fantastic location and photographic opportunities and we will return to the settlement itself for our last night here during which time we will also look to visit the famous Rockhopper shower location. Day 11: Using FIGAS we will today transfer to Sea Lion Island to the south of East Falkland where we will be based for 2 nights. Again, flight timings will be finalised the day before but there will be time for some afternoon and evening photography on our arrival. Day 12: A full day of photography on Sea Lion Island will offer lots of new opportunities within walking distance of our very comfortable lodge. Elephant Seals colonise the beaches and we are visiting towards the end of the pupping season so we will have young and suckling mothers on the beach as well as the end of season scraps between the males as they look to keep their harems together. It’s also the time of year when Orca are regularly seen both offshore and occasionally hunting seal pups in a small pool, we will also be able to access: a truly dramatic experience. The beaches here are excellent for photographing the famous surfing Gentoo Penguin as they come ashore after a day’s fishing at sea. There is a large Rockhopper colony across the island we will visit and by the time of our visit there should be youngsters to photograph. There are occasionally Macaroni Penguins in amongst the Rockhoppers so hopefully we will get the chance to broaden our coverage, and there are good numbers of Rock Shag and Imperial Shag in the area. With moorland on hand to search for very approachable Snipe, Dotterel and Plovers to add to the mix this will be a very busy day. Day 13: Using FIGAS we will transfer back to Port Stanley and the hotel we stayed at when we first arrived for our final 3 nights. Again, the advised flight timings will shape our photographic options in the morning: the afternoon gives the only time we have on the trip to just get a feel for the settlement of Stanley itself. Days 14 – 16: Each of these 3 days will involve a long but rewarding day at one of the photographic jewels of the Falklands, Volunteer Point. This is the home of the largest King Penguin colony and there should be over 1000 birds here at all stages from first year young, new-born chicks and many adult birds. These birds are remarkably approachable, and the photographic opportunities are almost endless at what is one of the most scenic locations in the world that they breed at, and it justifies a full three days here to finish the trip. Sealions fish off the beach and there is also a Gentoo Penguin and Magellenic Penguin colony here. Based on the weather we will look to get to the beach area as early as practical (it is approximately 2 hours each way by land rover) and during the course of the three days everyone will spend one night at the small warden’s house on the beach (we will fill it up with just half of us) with the other half returning to Stanley and returning to Volunteer for the next day. This way everyone gets the opportunity of an evening and early morning’s photography here. Day 17: For our final early start we will sadly be heading only to the airport at Mount Pleasant for the long flight back to Brize Norton, again with a short refuelling/leg-stretching stop at Ascension Island. Day 18: Arrive back at Brize Norton in UK. Airport transfers, all accommodation and meals throughout, all internal transportation within the Falklands and access permits as required. International flights to/from Mount Pleasant using the MOD service from Brize Norton (full details on booking this once you have confirmed your place on the trip) sundry items and alcoholic drinks. We will be staying in comfortable hotel/hostel style accommodation throughout the trip other then the one night on the uninhabited Steeple Jason island where we will stay in an extremely comfortable but inevitably more communal research station (which will be exclusive to us). Costs are based on a twin room sharing basis; single supplements for the majority of the trip may be available on early request. Although this is very much an outdoor trip in some remote places they are all very accessible and the option of 4WD drop-offs and collections are available in pretty much all of our locations should you want making this potentially not too challenging physically for the majority of the time. Access to Steeple Jason island though does involve a landing onto the rocks rather than a jetty so a reasonable assuredness of foot is required, and to access the albatross colonies does involve a walk through tall tussock grass. Early mornings/late finishes are generally a personal choice.